decorations and gifts made by hand and heart. 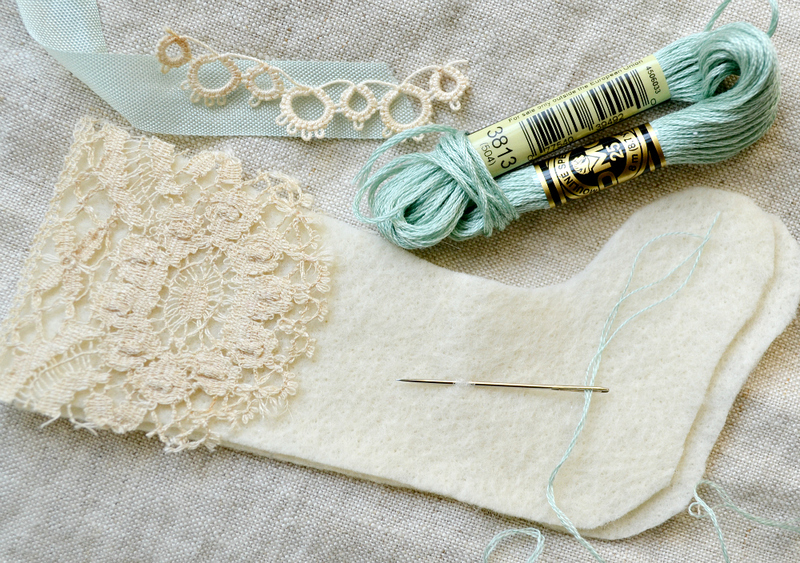 this little stocking for my Jane Austen tree. with text from some of Jane's own stories. ribbon and trim as well as a vintage rhinestone to make it. I used embroidery floss to sew a blanket stitch around the stocking. Then I sugared it up with some Martha Stewart's glitters. Oh how I love glitter! I do so love creating gifts and decorations myself. As I am doing this post, my sister is working on a gorgeous necklace. It is like the North Pole here with us crafting away! If you would like to join in Deck The Halls Sunday and share what you are creating for the holiday, just join in with Linky tools below and I will come and visit you. Ohhh, this is so cute! Love the colours. 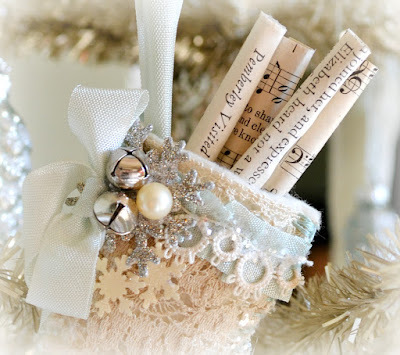 Ideas have been swirling around in my head all day...must be off to do some of my own Christmas creating! Hi Terri! Thank you so much for the invitation!!! I did link up, and edited my post to include a link to your lovely blog as well! Your stocking is just lovely and right up my alley! Have a wonderful and creative Sunday! Beautiful -- love the soft colors! Hi, Terri, the stocking is just gorgeous. The colors are so pretty together, the whole tree must be beautiful. I have a bunch of patterns on the way to me from several of my blogging friends and I can't wait to get started on them. Your stocking is gorgeous Terri and congrats on your beautiful grandson! CUTE CUTE CUTE...and there is NEVER too much glitter! How nice that your sister and you are crafting together, too. Your Jane tree is going to be extraordinary, Terri! Just when I think the Jane Austen tree can't get any better, you go and create another lovely piece for it! What a gorgeous project! Just perfect. :) Thank you for sharing! This is totally Jane Austin! It has the perfect colors. Love! Your stocking is just lovely. I can't wait to see it on your Jane tree. Thank you for sharing and hostessing! That is so lovely, Terri.I love the colors...eve if they are not true!!! Your little stocking looks like magic, dear Terri- beautiful with the sewing around the edges, and the wonderful colours.Your tree will be fabolous,when you finish decorating. This little stocking is too sweet. It will be lovely on your tree! 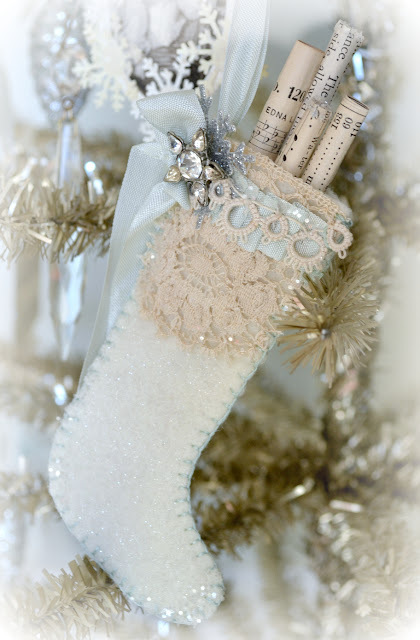 This is such a cute stocking, Terri! I really enjoy doing crafts myself. Thanks for hosting a wonderful party. This looks great! I am planning a post on a couple of things I just made! Will surely share! Hi, Just found your blog and love your darling stocking and decided to join your party. Thank you for hosting! Terri, your stocking ornament is gorgeous! I can't wait to see your tree all decked out in Jane Austen style. It's going to be beautiful!